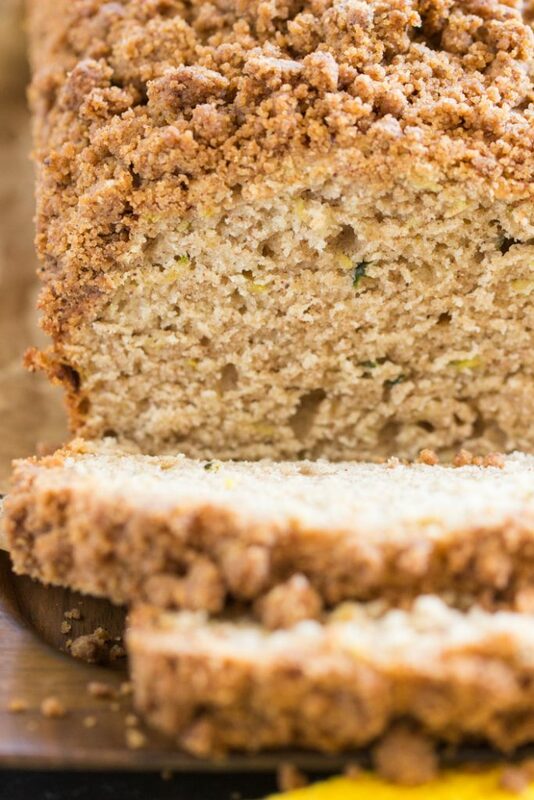 Moist, dense, and hearty Banana Zucchini Bread, loaded with spice and brown sugar streusel! 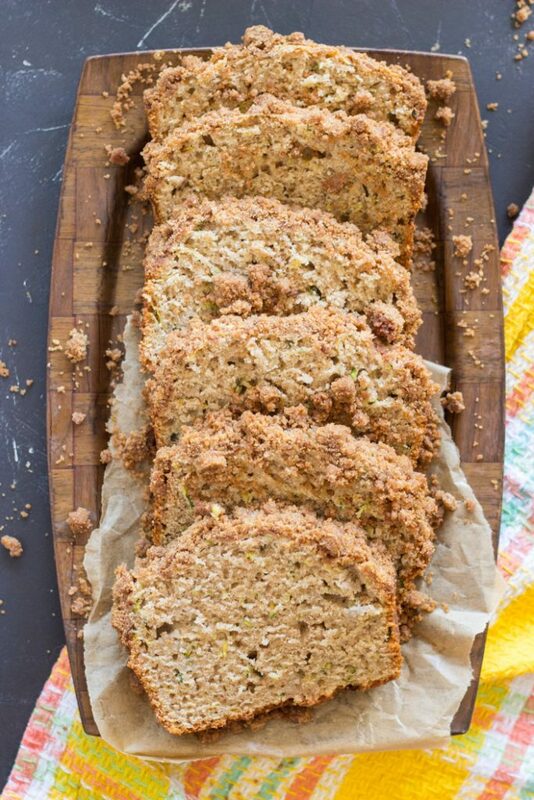 This Zucchini Banana Bread with Streusel Topping will actually make you happy that your garden is overgrown with zucchini! 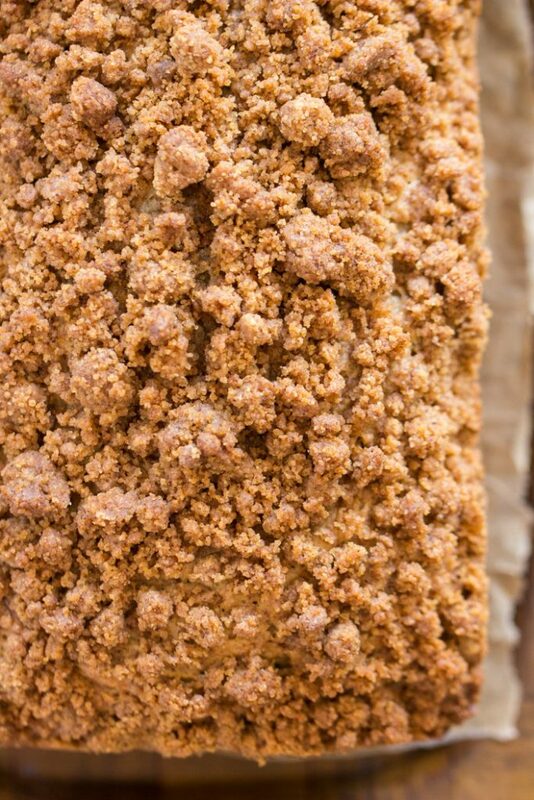 It’s easy to whip up, and the streusel makes it extraordinarily special! Not your ordinary Banana Bread recipe. 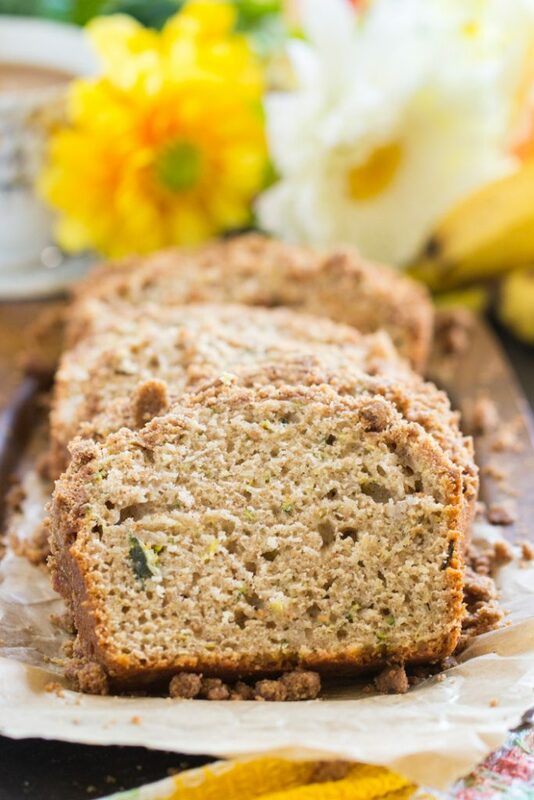 Not even your ordinary Zucchini Banana Bread recipe! 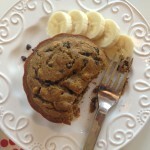 I didn’t think Zucchini Banana Bread was ordinary in the first place, but a quick Google search proved me quite wrong. Couple reasons. First and foremost: the streusel. This is a Zucchini Banana Bread With Streusel Topping, to go by its official name. Sometimes I wonder why I bother to make any sort of bread or muffins without streusel. Like, why? Shouldn’t everything have streusel? I guess it’s good to keep things lighter sometimes, but in this case, I’m beyond delighted that I included streusel on top of this bread. Does it need it? No. But I like to be extra. Streusel is extra, but it’s always worth it. This one is equal parts flour and brown sugar, loaded with cinnamon, and quite saturated with butter. Would you want it any other way? Even this Chocolate Zucchini Coffee Cake uses that streusel, but I added cocoa powder to it so that it’s a chocolate streusel. Fun, huh? Okay, speaking of zucchini, that’s the other part of this Banana Bread recipe that is inordinate: the addition of zucchini. 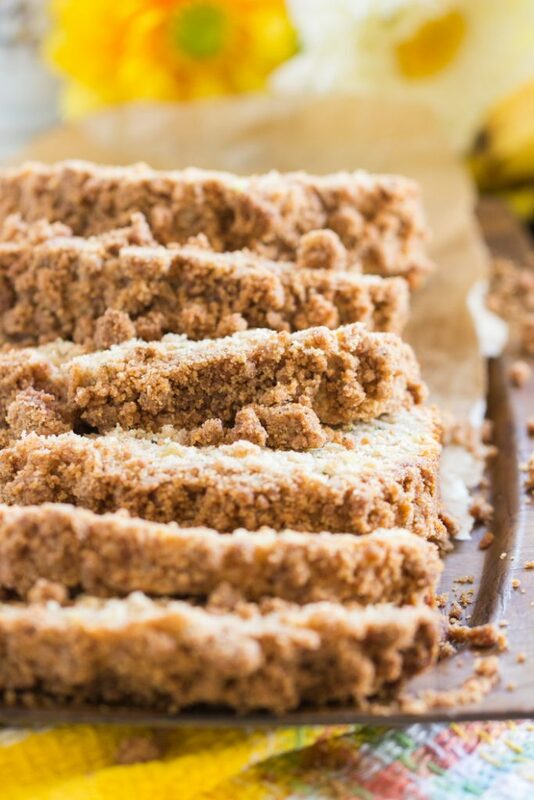 It just does something special to this Zucchini Banana Bread With Streusel Topping, and to whatever else it touches when you use it in baked goods. Zucchini is pretty magical for a veggie. It adds moisture, and interestingly, a touch of sweetness too. Lastly, this Zucchini Banana Bread With Streusel Topping is perfect because I started with a base that is tried-and-true. I’ve used the same banana bread recipe for almost a decade now. In the world of baking, that’s a pretty big deal. Things change fast, and there’s always something better that comes along. Not with this banana bread recipe. It’s a keeper, and I’m not switching anytime soon. To stay faithful to a recipe for so long, especially a recipe that is often recreated and reinvented, is a big deal. I’ve adapted my banana bread recipe a number of different ways and it never fails. 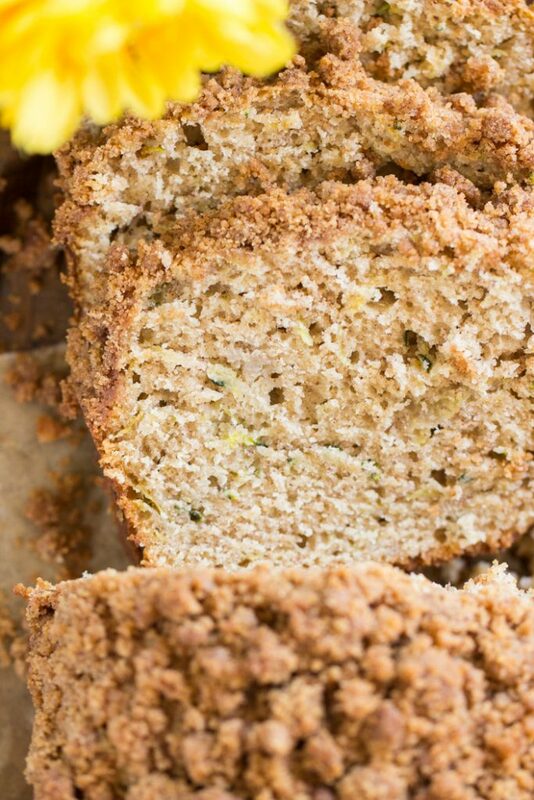 This Zucchini Banana Bread With Streusel Topping is the latest. I’ve also made a Blueberry Banana Bread Recipe, and this fall-themed Pumpkin Banana Bread, as well as a few other variations! 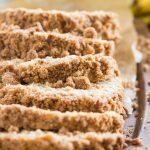 This Zucchini Banana Bread With Streusel Topping features a lot of banana flavor, and it’s moist, dense, hearty, and simple! 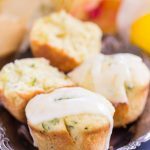 Throw in two full cups of shredded zucchini, and you get the bonus features of what zucchini does for baked goods. 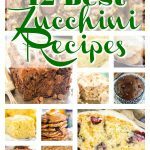 Top it generously with sweet, crunchy, brown sugar streusel, and this is a recipe that will actually make you grateful that you’ve got zucchini coming out of your ears. 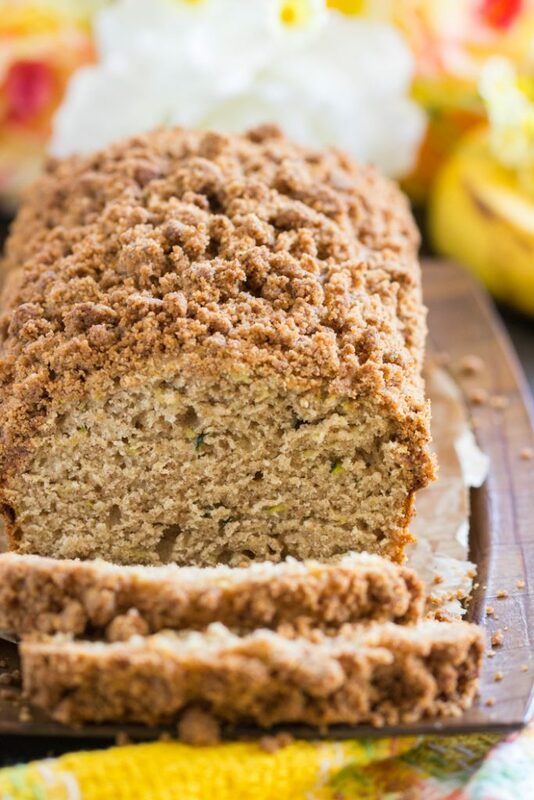 Moist, dense, and hearty Banana Zucchini Bread, loaded with spice and brown sugar streusel! 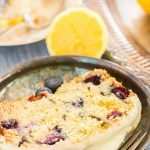 This Zucchini Banana Bread with Streusel Topping will actually make you happy that your garden is overgrown with zucchini! In a large bowl, whisk together eggs, sugar, oil, zucchini, bananas, and vanilla. In a medium bowl, whisk together flour, salt, baking soda, and cinnamon. Spray a 9x5-inch loaf pan with non-stick spray. Add 4 tbsp. melted butter, cutting it in with a fork or knife until crumbly. 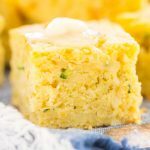 If needed, add an additional tablespoon of butter, stirring until mixture resembles mostly pea-sized crumbs. It was easiest to use my fingers to stir and crumble the mixture! Scatter crumbs evenly over top of the bread. Bake at 325 degrees for 50-60 minutes, or until edges are golden and a toothpick inserted near the center comes out clean.